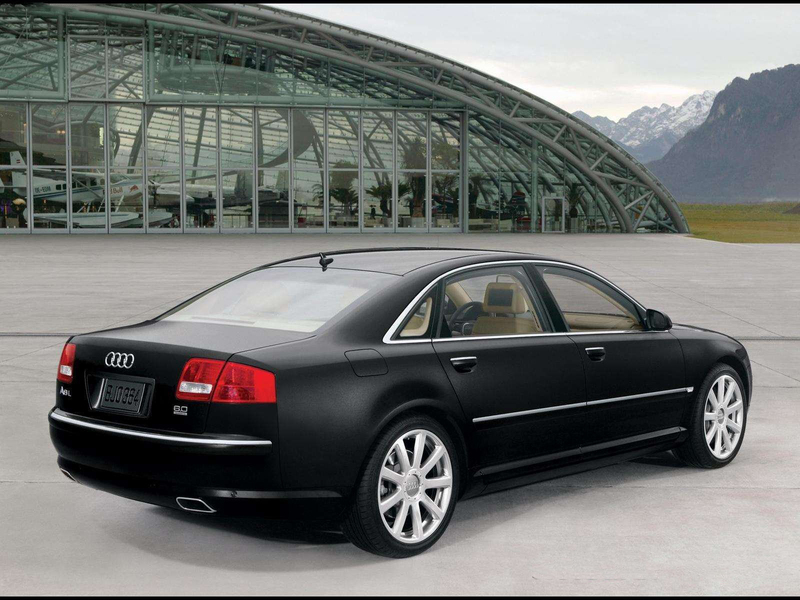 The Audi A8 is a four-door, full-size, luxury sedan car manufactured and marketed by the German automaker Audi since 1994. 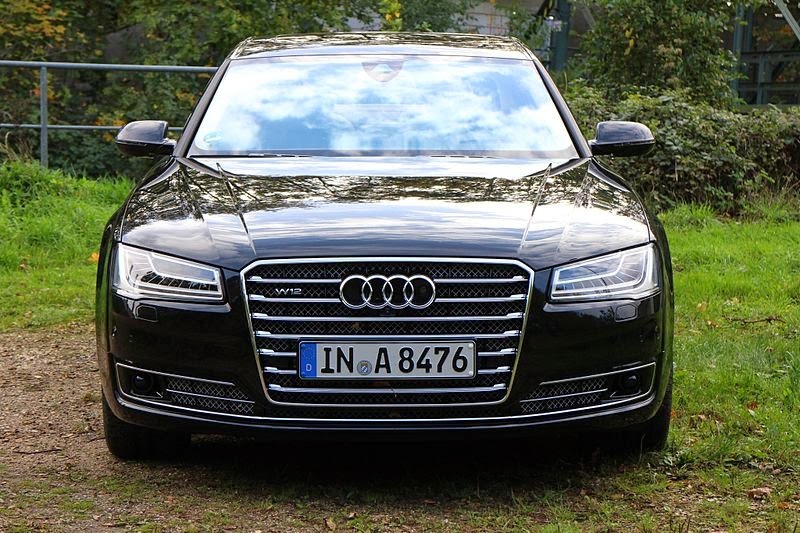 Succeeding the Audi V8, and now in its third generation, the A8 has been offered with both front- or permanent all-wheel drive—and in short- and long-wheelbase variants. The first two generations employed the Volkswagen Group D platform, with the current generation deriving from the MLB platform. 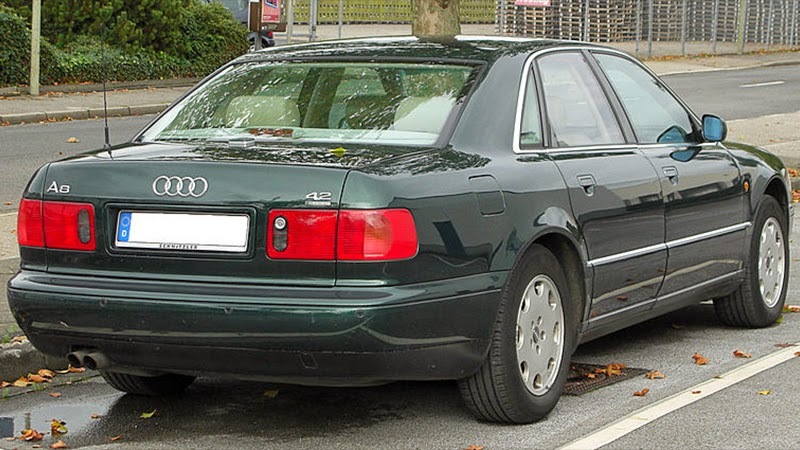 After the original model's 1994 release, Audi released the second generation in late 2002, and the third and current iteration in late 2009.
Notable for being the first mass-market car with an aluminium chassis, all A8 models have utilised this construction method co-developed with Alcoa and marketed as the Audi Space Frame. In 1982, Ferdinand Piëch signed an agreement with Aluminum Company of America. The objective was to design and develop a car that would be substantially lighter than any other vehicles in its class. In the late 1980s, it was decided that the target vehicle would be a successor to the V8 (Typ 4C) flagship introduced in 1988. By 1991, a final design by Chris Bird and Dirk van Braeckel was chosen and frozen for series production in 1992. 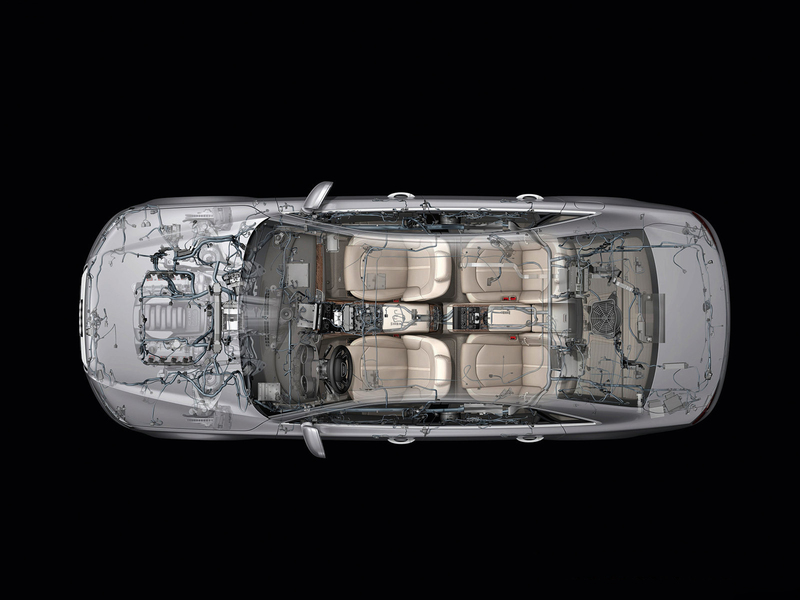 In September 1993, the Aluminum Space Frame (ASF) Concept was unveiled at the 1993 Frankfurt International Motor Show (IAA) as a D2 Typ 4D prototype in polished aluminum. Pilot production began in December 1993 and development ended in early 1994, at a total cost of $700 million (£418.1 million). The Audi A8 (Typ 4D) was presented in February 1994 and debuted at the 1994 Geneva Auto Show in March, with full-scale factory production commencing in June 1994, although it was not until October 1996, for the 1997 model year that it became available in North America. Unlike its predecessor, the Audi V8 model, which was built on an existing steel platform, the A8 debuted on the then-new Volkswagen Group D2 platform, an all aluminium monocoque, marketed as the "Audi Space Frame" (ASF), which helped to reduce weight and preserve structural rigidity. The saloon/sedan was offered in both the A8 (standard wheelbase), and the A8 L extended or long-wheelbase (LWB) version. 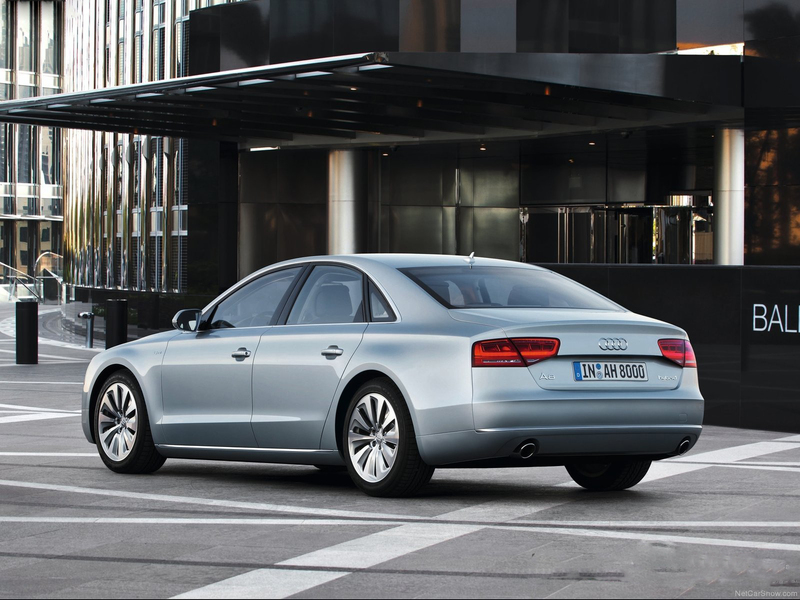 The A8 L adds 5 inches (127 mm) of rear legroom. Updates to the car in 1997 included the addition of six interior airbags. 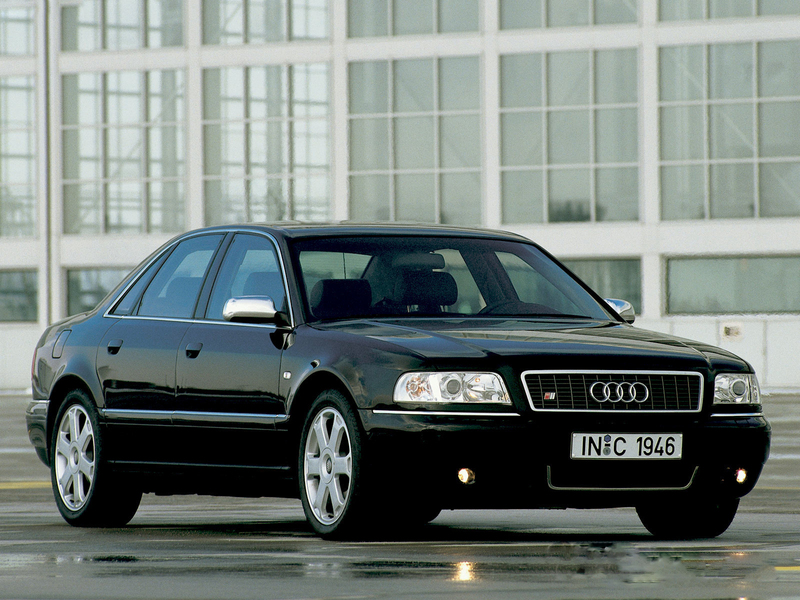 For 1997, the new A8 was available with either front-wheel drive (FWD), or the Torsen-based quattro permanent four-wheel drive. 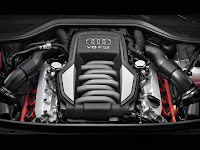 The FWD models are powered by a 2.8-litre V6 engine, producing 142 kilowatts (193 PS; 190 bhp), and a 3.7-litre V8 engine producing 171.5 kilowatts (233 PS; 230 bhp), while the quattro received a 4.2-litre V8 producing 220 kilowatts (299 PS; 295 bhp). In 1999, Audi's flagship received new colours, and restructuring of option packages. 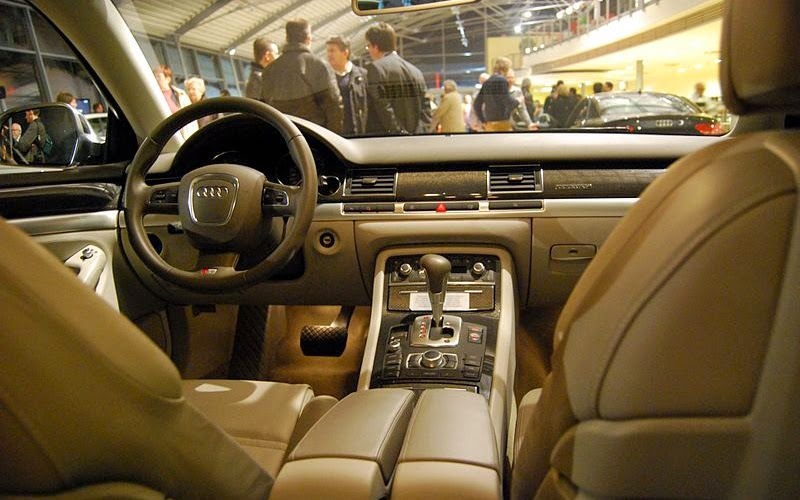 The North American "warm weather package" added a solar sunroof which allows the interior ventilation fans to run, keeping the interior cool while the car is parked with the engine turned off. Changes to all models included a larger passenger-side mirror, and a first aid kit located in the rear centre armrest. 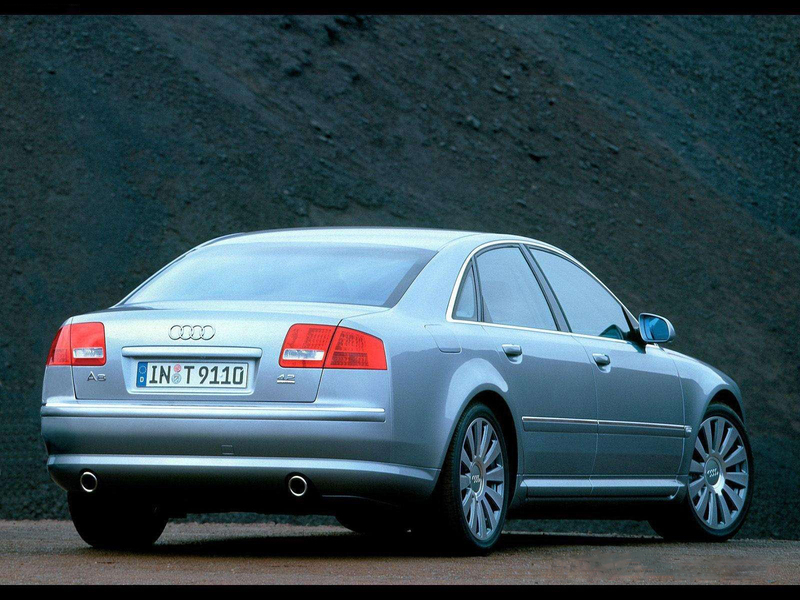 For 2001, the A8 received side curtain airbags. 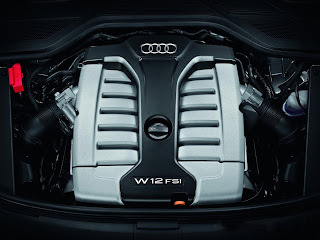 In 2001, Audi introduced its new W12 engine, a compact 6.0-litre unit developed by effectively mating two VR6 engines together at the crankshaft. The engine quickly became available in the A8, though only to European and Asian customers. 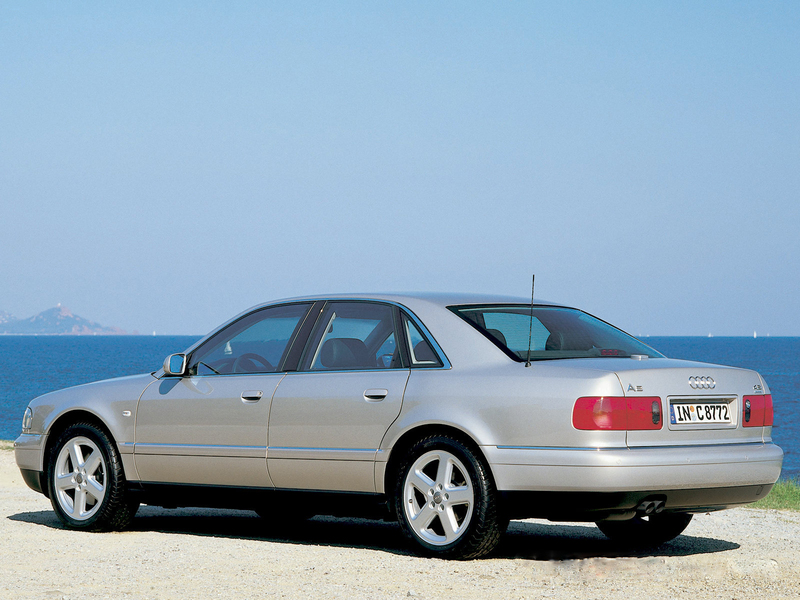 From its introduction through its discontinuation in 2003, only 750 of the D2 "W12" models were produced. 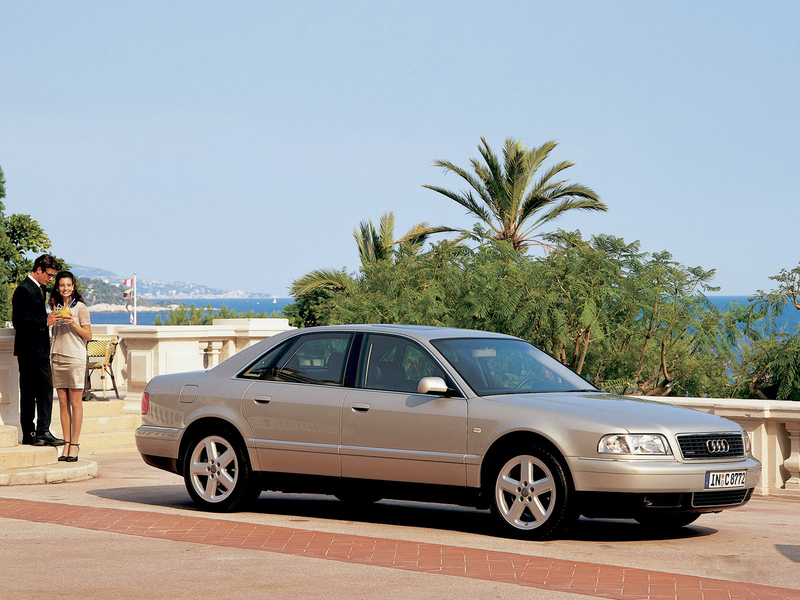 2001 also marked the debut of the high-performance S8 variant in North American markets. 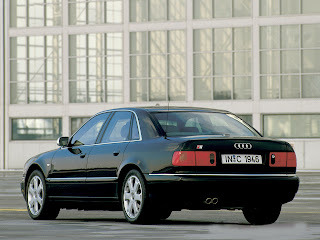 In 1997, IVM Automotive of Munich, Germany built a two-door Audi A8 Coupé. The car was unveiled at the 1997 Geneva Motor Show. Audi contracted IVM to build the prototype, and was considering production of the vehicle. 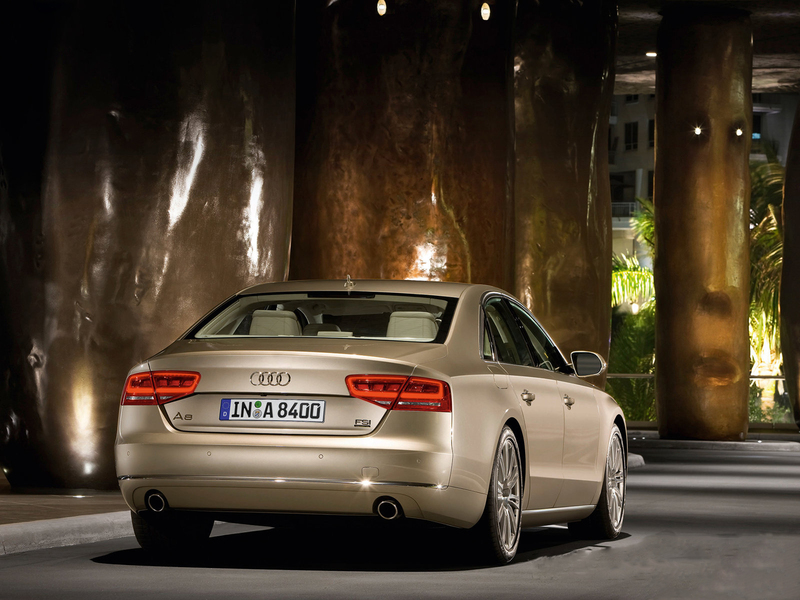 The coupé had a re-engineered aluminium body, shorter than the production A8 saloon. Like the Mercedes-Benz CL-Class, there was no central "B" pillar, giving the car a seamless design with a gradually sloping roofline. The car included custom leather seats which could seat four. 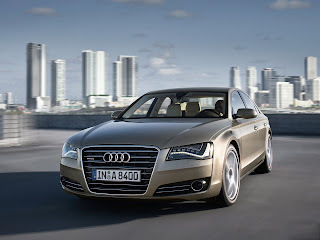 Ultimately, Audi decided not to put the A8 Coupé into production, citing lower-than-expected sales figures for the similar BMW 8 Series and Mercedes-Benz S-Class Coupé. 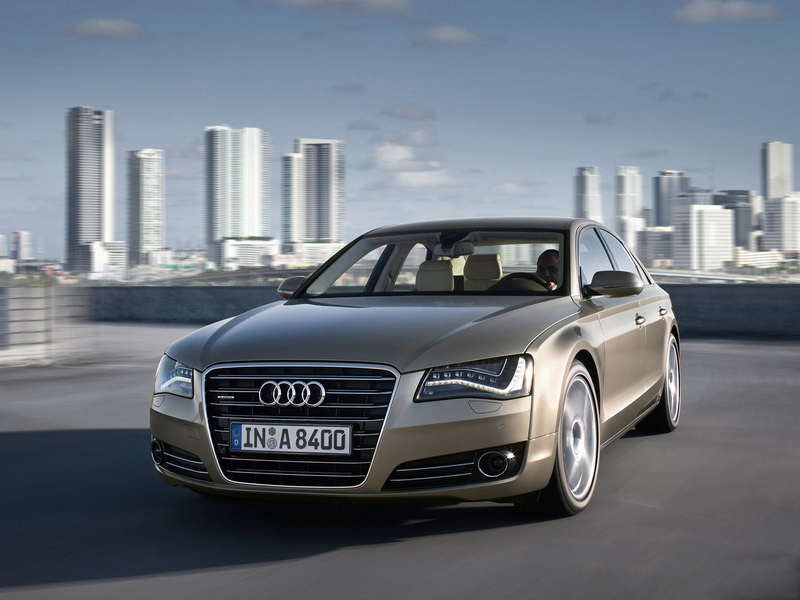 Only one A8 Coupé was ever built. The single prototype, painted in a colour called "Ming Blue pearl", remains the property of IVM Automotive, and resides in Munich. Its last public appearance was in 2002 on a series of test drives. The D2 series S8 featured an uprated, 250 kW (335 hp) version of the 4.2-litre V8 with four valves per cylinder. 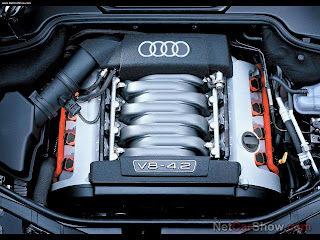 From late 1999, Audi increased this to five valves per cylinder with power increased to 265 kilowatts (355 hp) and 430 newton metres (317 lb·ft). 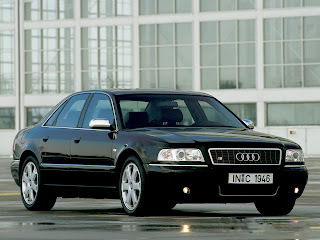 From launch in 1996, European-market models came standard with a six-speed manual transmission. A sports-recalibrated version of the ZF 5HP24 five-speed tiptronic automatic, featuring "Dynamic Shift Programme" (DSP) was released a year later and was the only transmission available in most other markets. 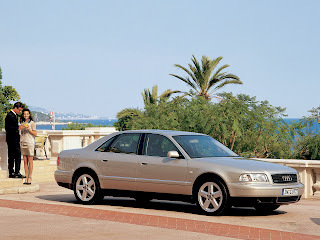 The second-generation Audi A8 (Typ 4E) built on the Volkswagen Group D3 platform was unveiled via press release in July 2002 and introduced in November 2002 in Europe and in June 2003 in the United States. The model was longer than the previous generation, with room for four or five large adult occupants in the cabin, depending on rear seat configuration. 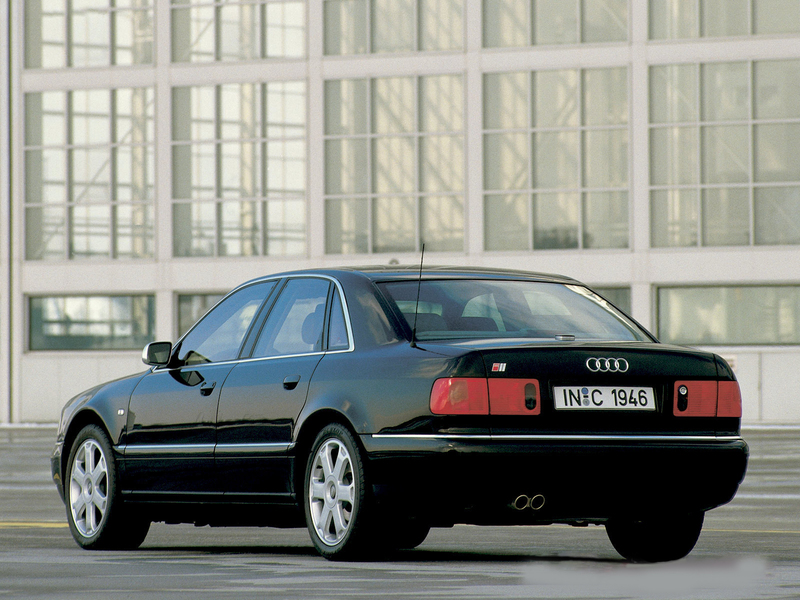 The D3 development program began in 1996, with the design process commencing in Ingolstadt in 1997. The whole Audi design studio based in Ingolstadt first contributed sketch proposals, from which numerous different themes emerged. Six of them were developed into full size clay models and worked up in a traditional manner adjacent to full size tape drawings. At least three one quarter scale models were produced to explore other design variations. Grouping major controls nearer the driver for a more driver focused identity whilst creating a more airy and spacious feel were early priorities for the interior design team was headed by Jurgen Albamonte. 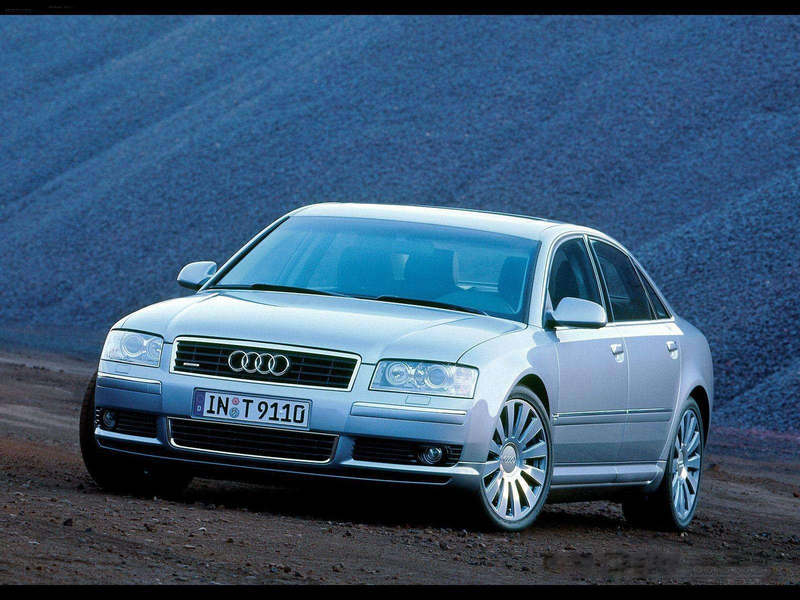 This was in part facilitated by the MMI interface, designed by Jurgen Schröder, that pioneered on the D3 A8 after the Avantissimo concept car preview, and also by class leading colour and trim from Barbara Krömeke and Melinda Jenkins. 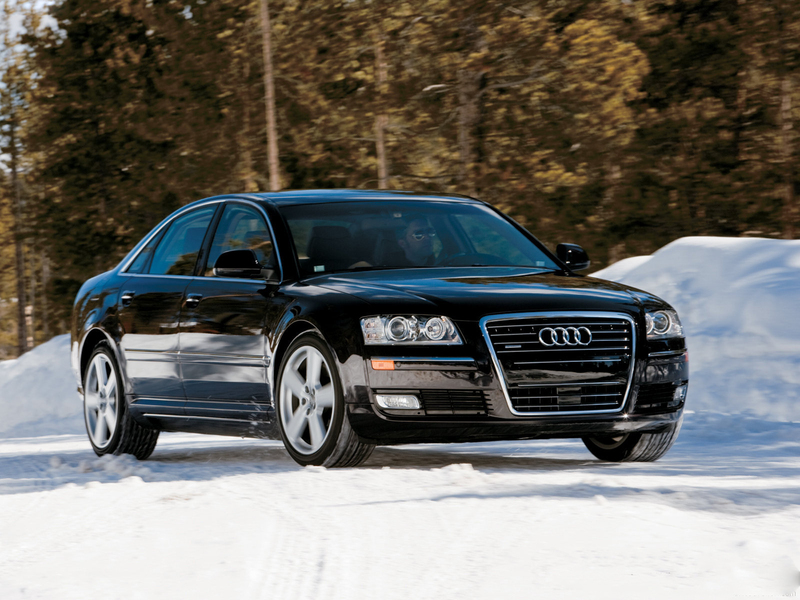 From 2005 or 2006 Audi started offering the optional 1,000-watt 14-channel ICEpower Bang & Olufsen sound system. 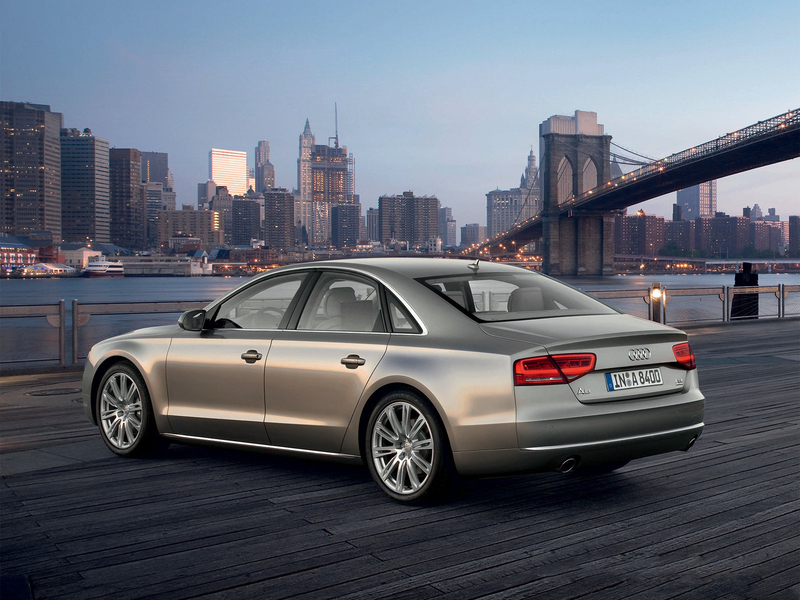 From September 2007 for the 2008 model year, the A8 received a facelift and also received new electronic safety systems. 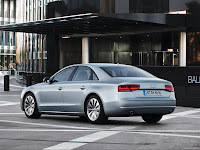 "Audi Side Assist" detects cars in the A8's blind spots. 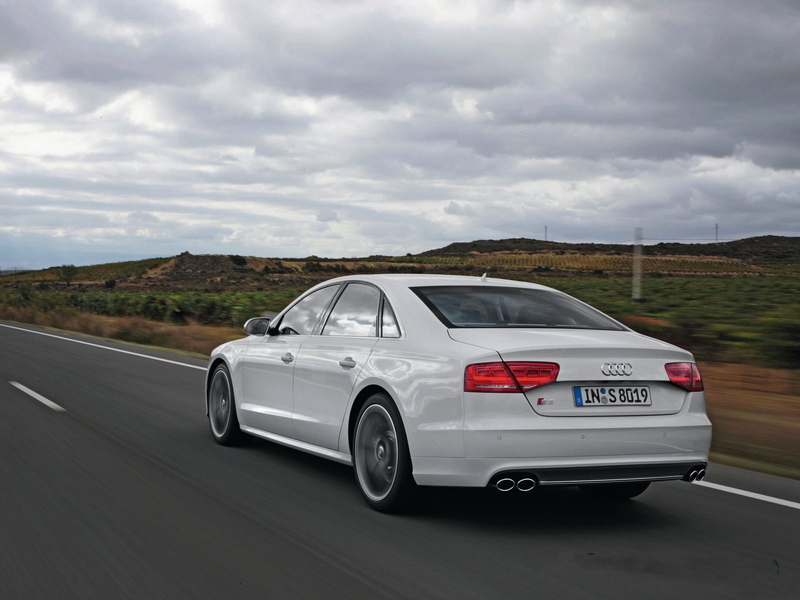 "Audi Lane Assist" helps when the driver attempts to change lanes without signalling first. It is an armoured vehicle with B6+ and B7 (European standard) ballistic ratings. It includes a W12 engine rated 331 kW (450 PS) and 580 Nm (428 lbft), emergency exit system featuring pyrotechnic blown-out doors, fire extinguisher system with spray jets located in the engine compartment, underbody and in the wheel arches; smoke extractor in passenger compartment, run flat tires, bullet proof windows, the full protection plus package and LED flashers in the exterior mirrors. Buyers are also offered facility to dispatch two drivers on a special training course. 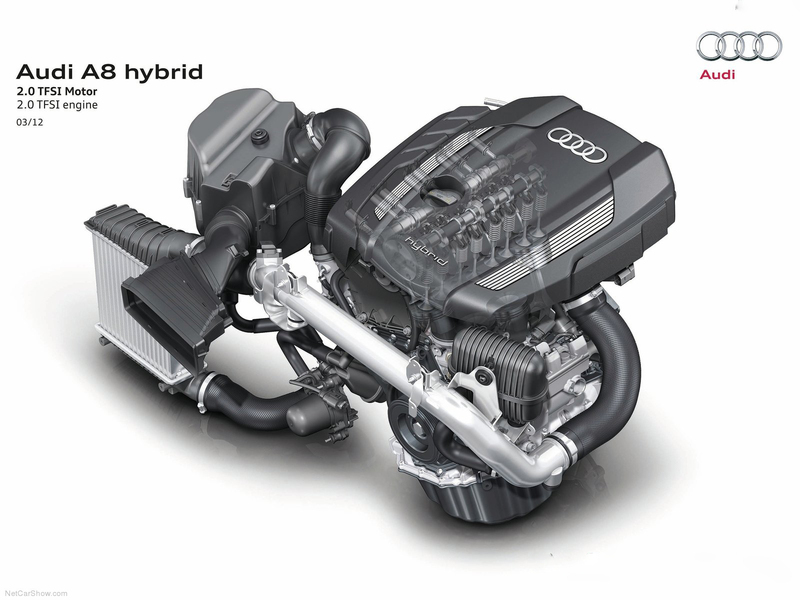 The D3 series S8 features a 5.2-litre all-aluminium alloy four-valves per cylinder V10 petrol engine. 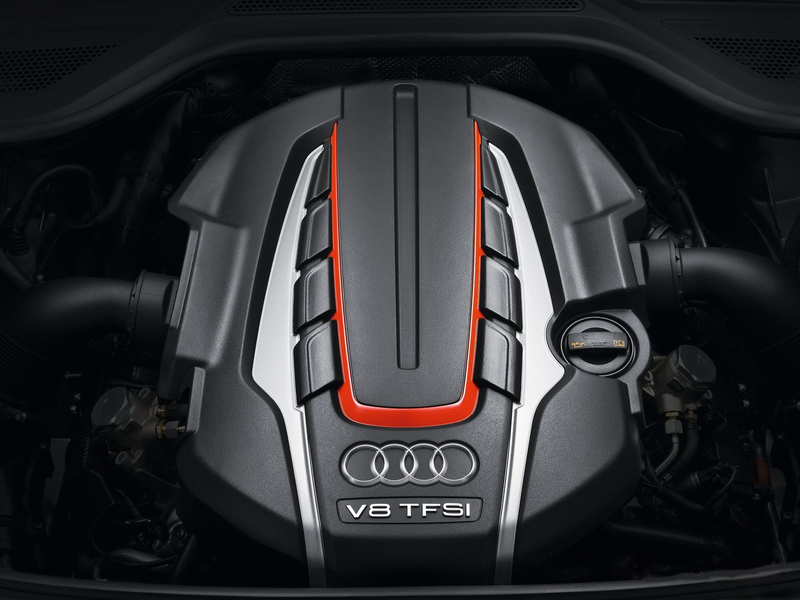 This engine is a derivative of the Lamborghini Gallardo's original 5.0-litre Lamborghini V10, which was also developed under the Volkswagen Group ownership. 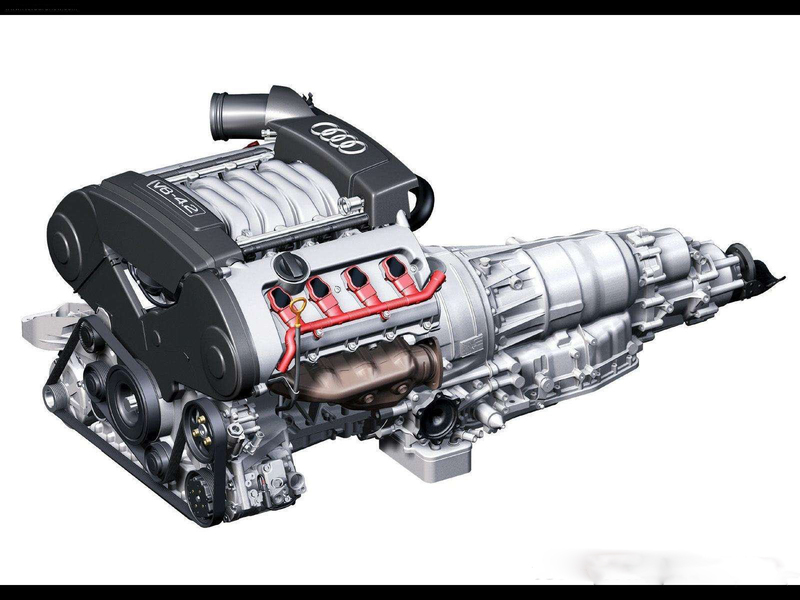 On this Audi-only variant, compared to the Lamborghini engine, it features a longer stroke and wider bore—which increases the displacement of the engine, and produces more torque at lower revs, making it more suitable for the larger and heavier full-sized luxury Audi application. 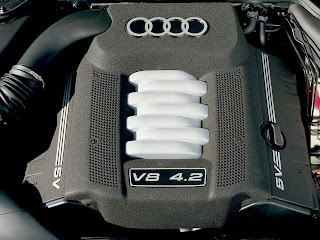 It produces 331 kW (444 hp) of power and 540 N·m (398 lb·ft) of torque. 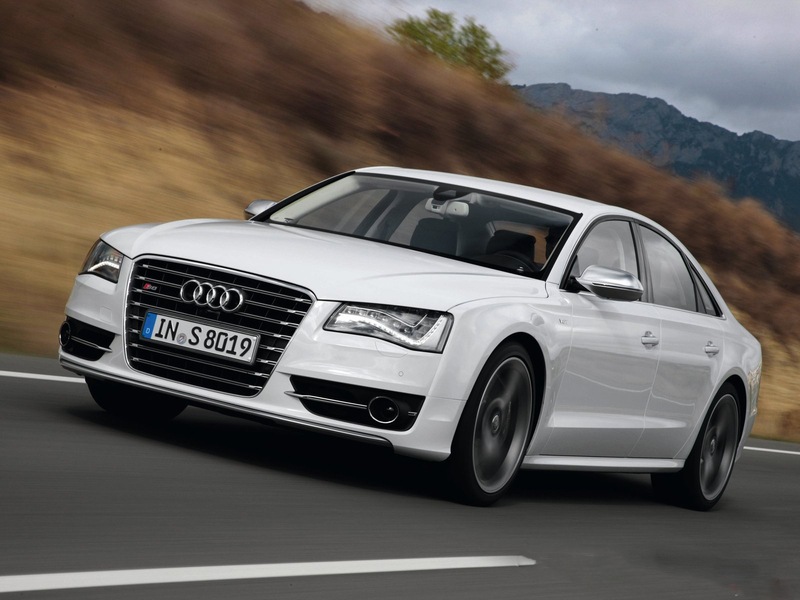 By having its bore whittled out an additional 2 millimetres (0.1 in), displacement in the S8 application increases from 5.0- to 5.2-litres. 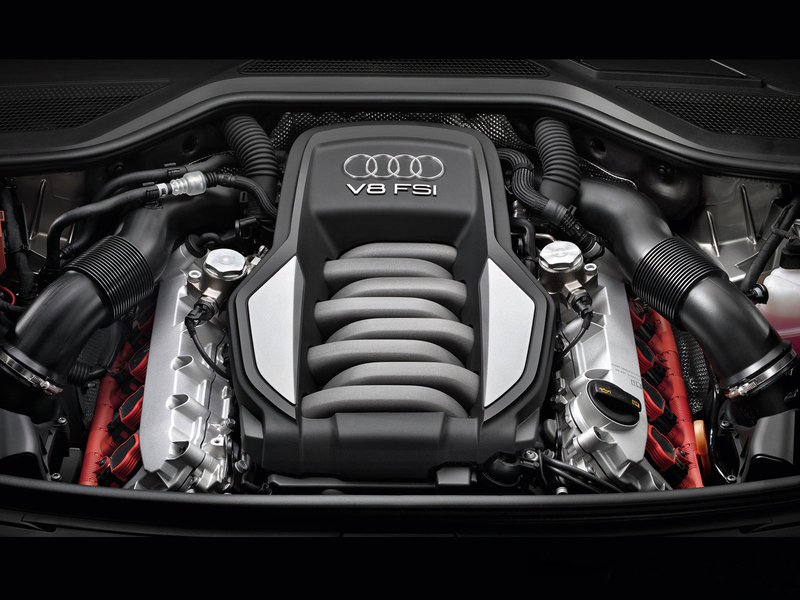 The engine also features Audi's direct-injection system, called Fuel Stratified Injection (FSI). A sports-optimised ZF 6HP26-A61 six-speed tiptronic automatic transmission with "Dynamic Shift Programme" (DSP) and "sport" mode, with steering wheel mounted paddle-shifters, is the only offering. 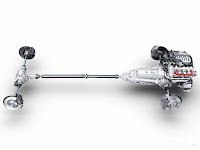 Output is transmitted via Audi's quattro all-wheel drive system, initially using the Torsen T-2 50:50 dynamic centre differential, and from 2007 for the 2008 model year, utilising the Torsen T-3 asymmetric dynamic centre differential, with a "default" torque distribution of 40 percent to the front axle and 60 percent to the rear. 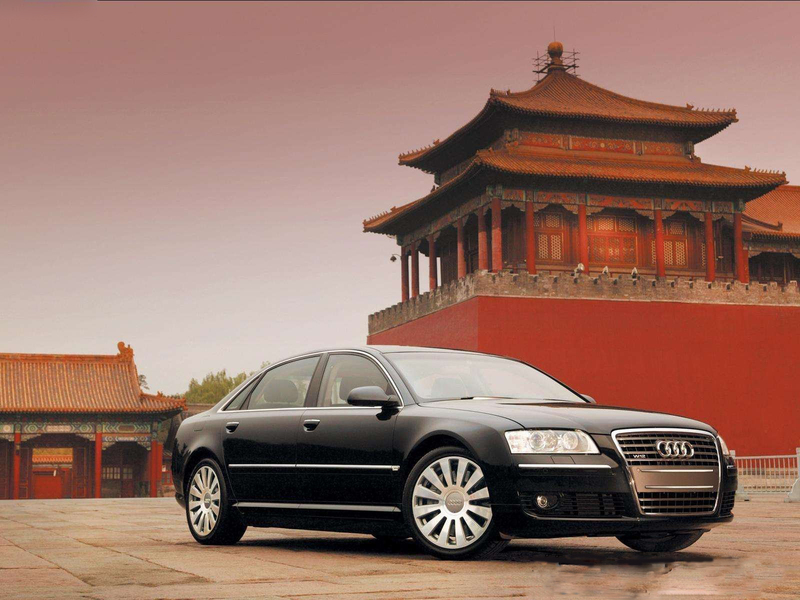 The A8L Centennial Limited Edition (奧迪A8L百年限量版) is a limited (800 units total) version of the A8L 3.0 FSI with multitronic and the A8L 6.0 W12 quattro for the Chinese market, commemorating Audi's 100th anniversary. 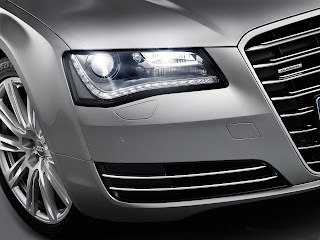 It included horizontal chrome-plated front grille (from the A8L 6.0 W12 quattro), "V6" metal logo at the upper left of the air-inlet grille (A8L 3.0 FSI), LED daytime running lights, heated leather steering wheel, 19-inch 12-spoke polished aluminium alloy wheels, heated steering wheel in grey leather with beige stitching, Bang & Olufsen advanced audio system, Alcantara equipment bag, Assam ash red veneer, floor mat with aluminium trim, a metal 'Audi exclusive' commemorative logo at inn door trims. The vehicles went on sale on the 18th October 2009 as 2010 model year vehicles. The vehicle was unveiled in Design Miami 2009 on 30 November 2009., followed by the 2010 North American International Auto Show. Initial internal combustion engine options comprise 4.2-litre Fuel Stratified Injection (FSI) petrol and Turbocharged Direct Injection (TDI) diesel V8s, with 273 kW (366 hp) and 258 kW (346 hp) respectively. A 3.0-litre V6 TDI with either 184 kilowatts (247 hp) or 150 kilowatts (201 hp) will be available later. 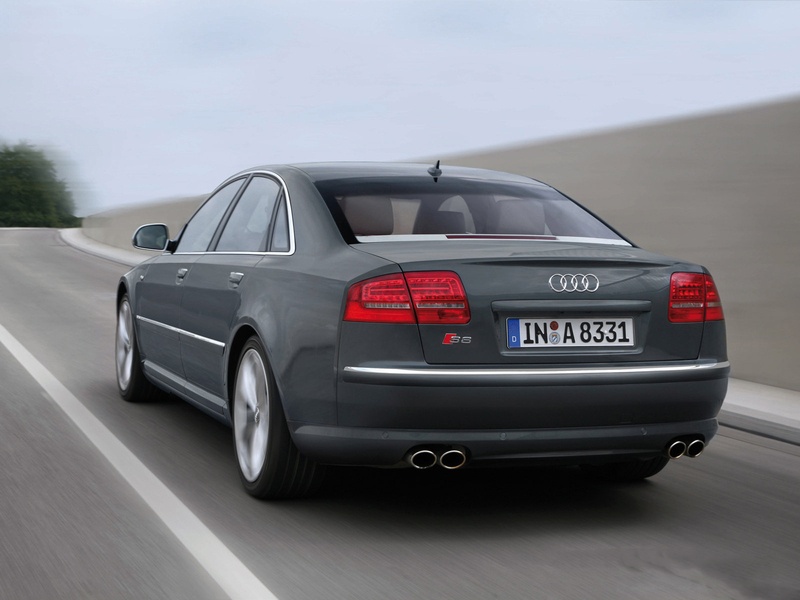 A 6.3-litre W12 engine only for the long wheelbase model was made available in 2010, and compared to its predecessor it has a larger displacement and direct fuel injection. All engines are mated to the new eight-speed ZF 8HP automatic transmission. Although other Audi vehicles such as the 2010 Audi S4 and 2011 Audi A7 had switched from the 5.0l V8 to the 3.0L supercharged V6, the Audi A8 retained a higher-output 4.2L V8 as the base engine for the 2011 and 2012 model years in North America. Taiwan models went on sale on the 11th November 2010 . 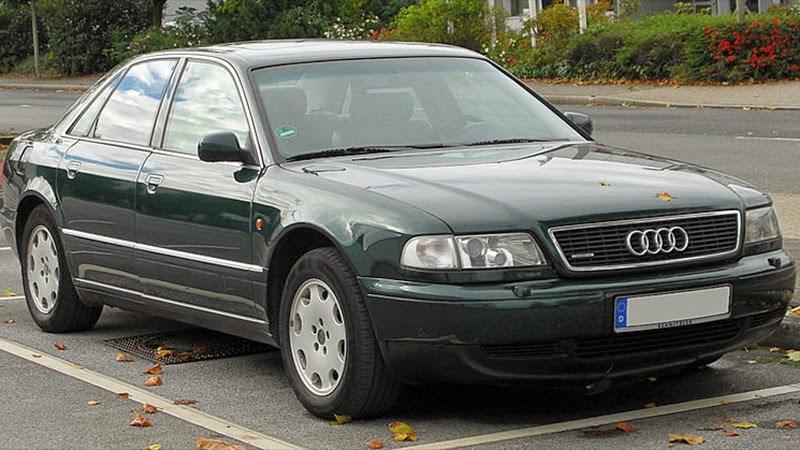 Early models include 3.0 TFSI quattro (290PS). 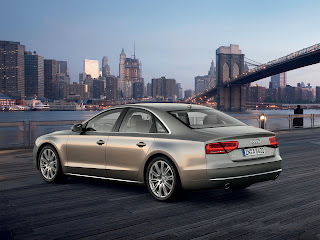 The vehicle was unveiled in Auto China 2010., followed by the 2011 Taipei Motor Show (A8 L W12 quattro). Chinese models went on sale in 2011. 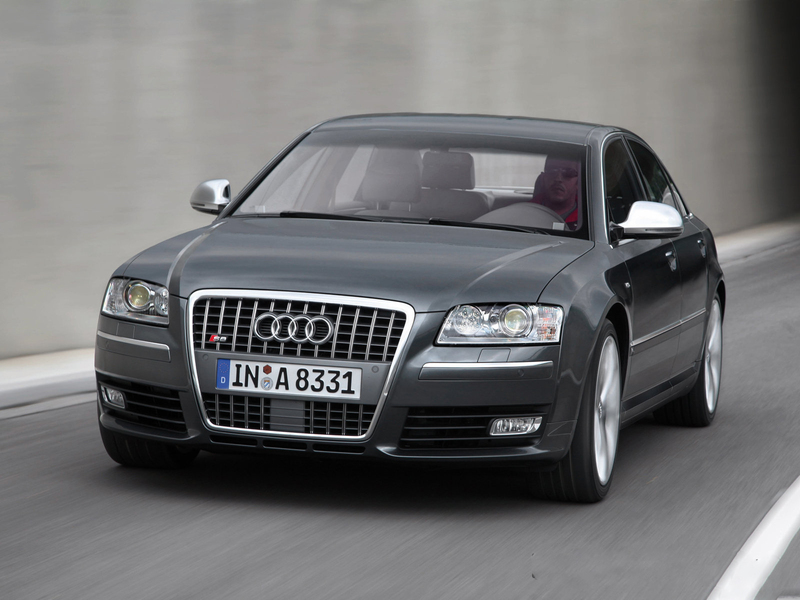 Early models include an A8L 3.0 TFSI low quattro (289PS), and a A8L 3.0 TFSI high quattro (333PS). 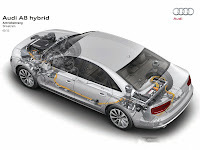 The concept vehicle includes a 2.0 TFSI engine rated at 211 PS (155 kW; 208 bhp) and 350 Nm (258.15 lbft) @1500–4200 rpm, a disc-shaped electric motor rated 45 PS (33 kW; 44 bhp) and 211 Nm (155.63 lbft), lithium-ion battery, luggage space of 400 liters (14.13 cubic feet), 21-inch wheels with 265/35 tires, Prism Silver body colour with Spectra Flair accent colour, 'hybrid' lettering on both front fenders, illuminated doorsteps with 'hybrid' insignia. 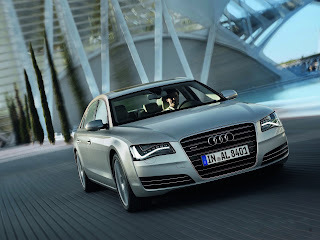 It is a version of the A8 L demonstrating long-term evolution (LTE) broadband technology. Developed in collaboration with Alcatel-Lucent, the car's mobile broadband connection is a fourth generation (‘4G’) technology with data transfer speeds of up to 100Mbit/s. 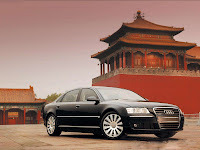 The A8 L Security is an armoured version of the A8 L with class VR 7 ballistic protection standard (tested as per BRV 2009 guidelines), resistance to explosions against a military hand grenade (tested as per ERV 2010 guidelines), with certain areas of the armouring complies with the criteria for class VR 9 and VR 10, a core safety cell made from hot-formed armoured steel, aramide fabric, ceramics, special alloyed aluminium and multilayer glass; overlapping protective materials at the joints, aluminum side sills with solid steel sections, aluminum alloy armored floor, side windows, windshield and rear window made of special glass with a polycarbonate coating; optional electromechanical window openers, closing assist feature comes standard for the doors, communication box in the luggage compartment (light ceramic doors, aluminum frame), optional battery and the fuel tank protection, two-way communication system with a speaker in the single-frame grille and microphones for the cabin and exterior, an emergency exit system with pyrotechnical separating screws in the hinges, fire extinguisher system, emergency fresh-air system with two oxygen cartridges, a smoke extractor for the passenger compartment, an LED signaling system for convoy travel, flashing lights, a siren, a preparation for professional mobile radio systems, a flag holder, a permanently installed telephone, an accident data recorder, an additional rearview camera and a heated windshield plus partially heated side windows, four-zone climate control system with an ionizer to freshen the air, electric rear blinds, the sonorous Bose surround sound system and a TV tuner, rear are two individual seats with power adjustment, front comfort seats with heating and optional massage and ventilation functions, standard full-leather package, optional relaxation seat (adjustable right-hand rear seat with a power-adjustable footrest, heating and massage), optional center console with large storage compartments and rear seat entertainment system with two 10.2-inch displays, optional folding table, optional refrigerator optional parking heater, Bluetooth car phone online, integrated UMTS module, optional separate telephone handsets, 19-inch forged wheels featuring in semipolished two-tone finish, 255/720 tires with a high load index of 117, synthetic rings on the rims, optional full-size spare tire. 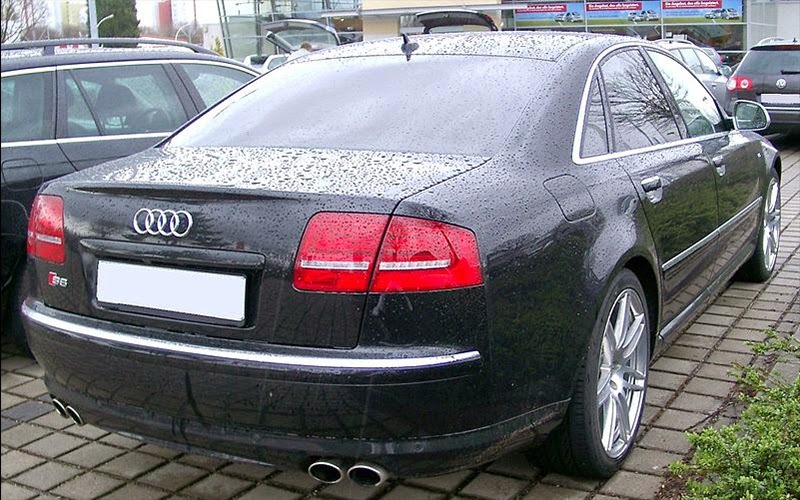 The first model included a W12 engine rated 368 kW (500 PS) and 625 Nm (461 lbft), with delivery began in late summer 2011. 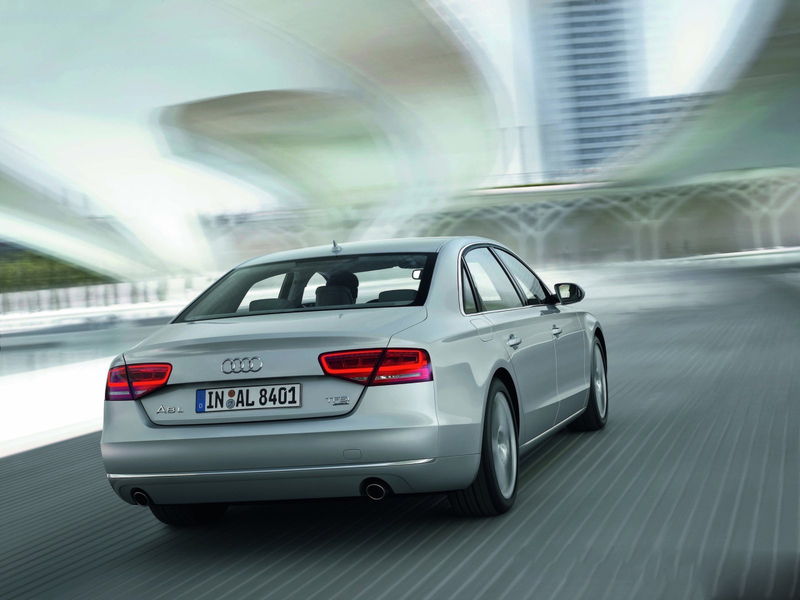 An additional engine model with improved fuel efficiency went on sale in 2012. The production version included an electric motor rated at 40 kW (54 PS) and a 210 N·m (155 lbf·ft), 1.3 kW (1.8 PS; 1.7 hp) lithium-ion battery, 18-inch 10-spoke alloy wheels in turbine blades design (optional 19-inch), hybrid badges, metallic paint finish (optional Arctic Silver body colour), three-zone automatic air conditioning, LED headlights, and a BOSE sound system. Pure electric mode is available for 3 kilometres (2 mi) at a top speed of 100 km/h (62 mph). It went on sale in 2012. 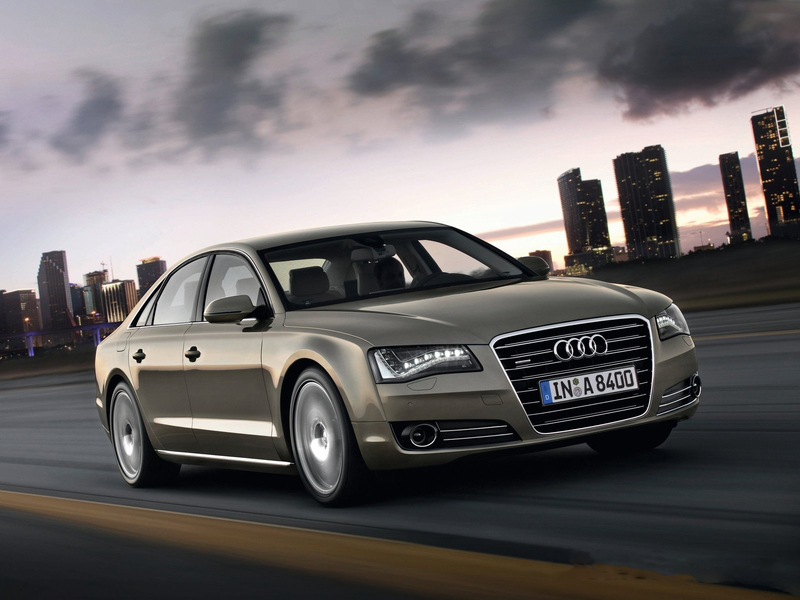 The D4 series Audi S8 4.0 TFSI quattro will go on sale in 2012. 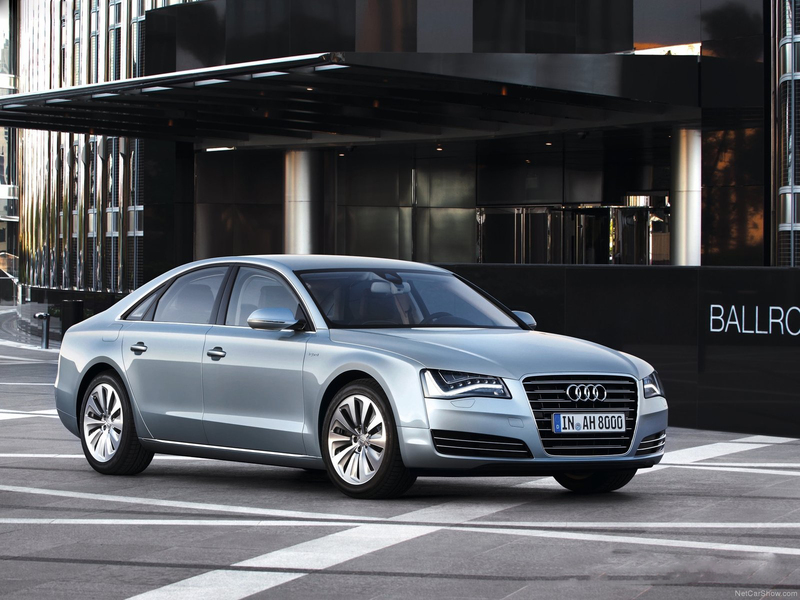 Like the previous iteration, the upcoming S8 is expected to cost less than the A8 L W12. 211 PS (155 kW; 208 bhp) @? 54 PS (40 kW; 53 bhp) @? 210 Nm (154.89 lbft) @? 245 PS (180 kW; 242 bhp) @? 480 Nm (354.03 lbft) @? 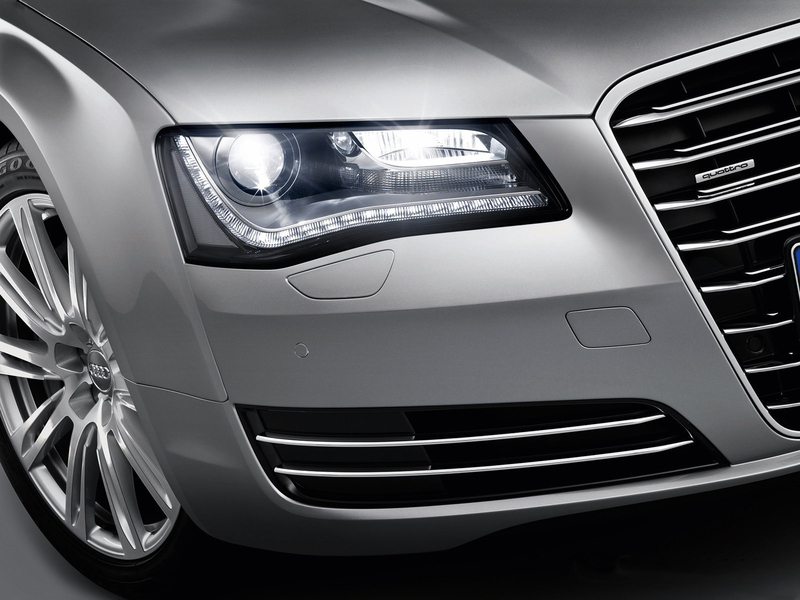 The D4 A8 features all light-emitting diode (LED) headlights, an enhanced Multi Media Interface with touchpad, and an optional 1,400 watt Bang & Olufsen sound system. 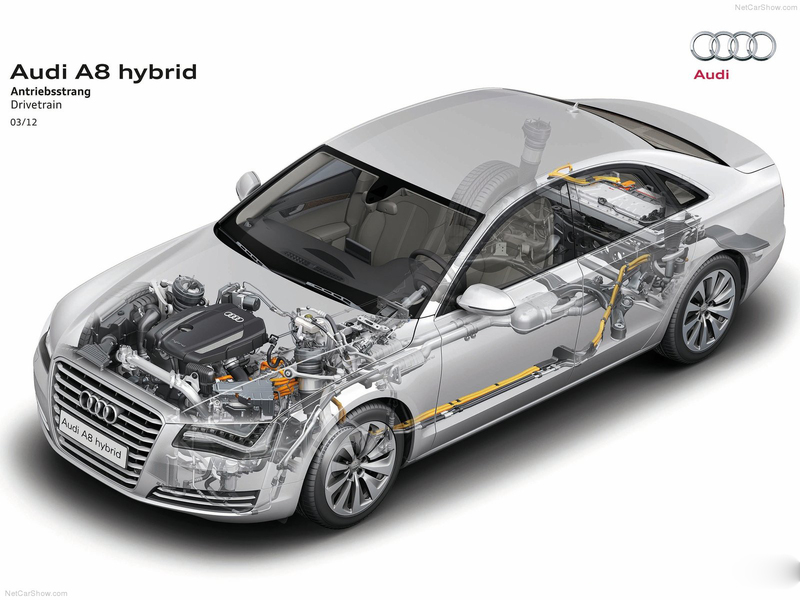 Optional A8 features include a driver assistance system networked using FlexRay technology. The GPS navigation system coordinates input to the adaptive headlights, transmission, cruise control and electronic stability control. The A8 also offers an optional driver control system for numerous sub-systems, marketed as MMI (Multi Media Interface) which can recognise handwriting inputs for the phone and navigation system and provide 3D navigation with Google Earth., optional night vision assistant with pedestrian recognition, and mobile broadband internet access with UMTS 3G and WLAN-Hotspot. 480 Nm (354.03 lbft @? 3,993 cc (243.7 cu in) V8 twin turbo? 500 PS (368 kW; 493 bhp)? 625 Nm (461 lbft) @4750? 2,967 cc (181.1 cu in) V6 turbo? 240 PS (177 kW; 237 bhp) @? 550 Nm (406 lbft) @1500–3000? All models include an 8-speed tiptronic transmission. 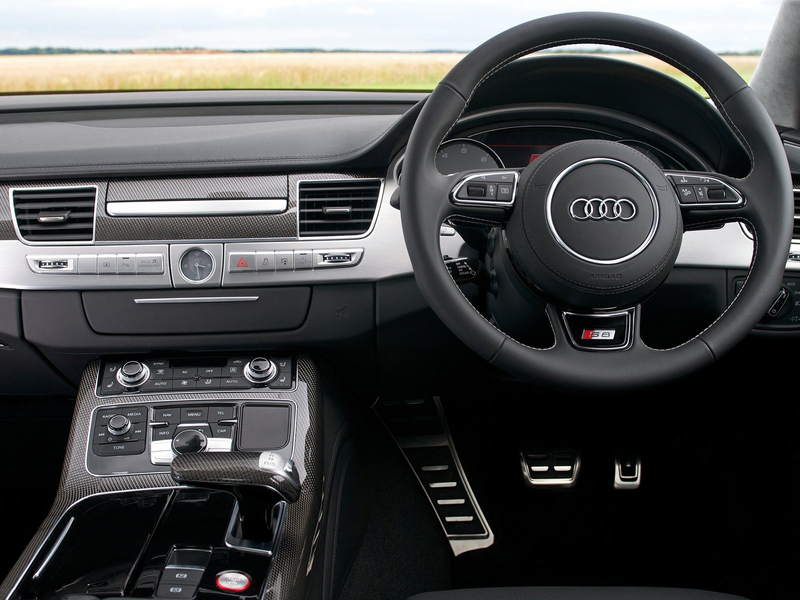 As part of the 2013 S8 4.0 TFSI quattro launch in the US, a TV commercial called 'Suspect' was produced in association with Venables Bell & Partners, USA, Furlined, The Whitehouse, 740 Sound Design & Mix, Lime Studios; starring Abigail Spencer. The ad takes cues from quintessential heist films with the S8 taking center stage against a mysterious and suspenseful bank robbery scene. As the thrill escalates, viewers will be left deciding whether a true robbery has transpired, or if the scene was purely a figment of the driver's imagination. With the power, speed and innovation of the S8 at the driver's fingertips, it's easy to get carried away behind the wheel of an Audi S model. The spot closes with the tagline "Heighten Every Moment." The commercial was premiered during the 2012 NFL season kick-off game on 05-09-2012. 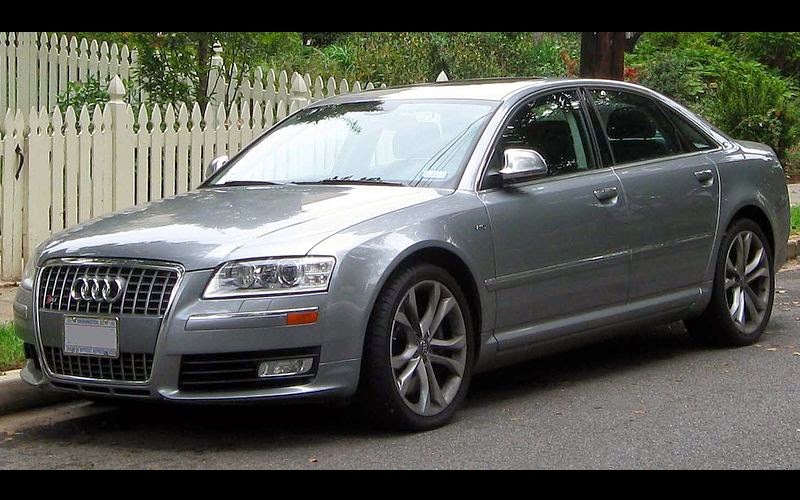 The "Suspect" commercial featuring the Audi S8 would also air in NFL on CBS and NBC, and select cable networks, including: Food, FX, National Geographic, ESPN, USA, CNN, and AMC. A 30-second version would also be viewable on CNN.com, Reuters.com, Wired.com, Yahoo! and more. 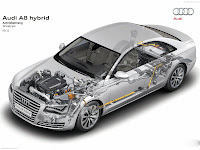 Changes include additional noise damping, altered trunk layout with optional power trunk closing assist, headlights with optional Matrix LED technology, flatter rear LED lights joined together by a continuous chrome strip, redesigned bumper houses two rhomboid tailpipes (except S8), available wheel sizes up to 21 inches with 275/35-series tires, optional sport differential (standard on S8 and A8 4.2 TDI clean diesel quattro), standard electromechanical power steering (optional dynamic steering varies its ratio with the car's speed), new assistance systems (Audi active lane assist, park assist system with 360° display, night vision assistant). 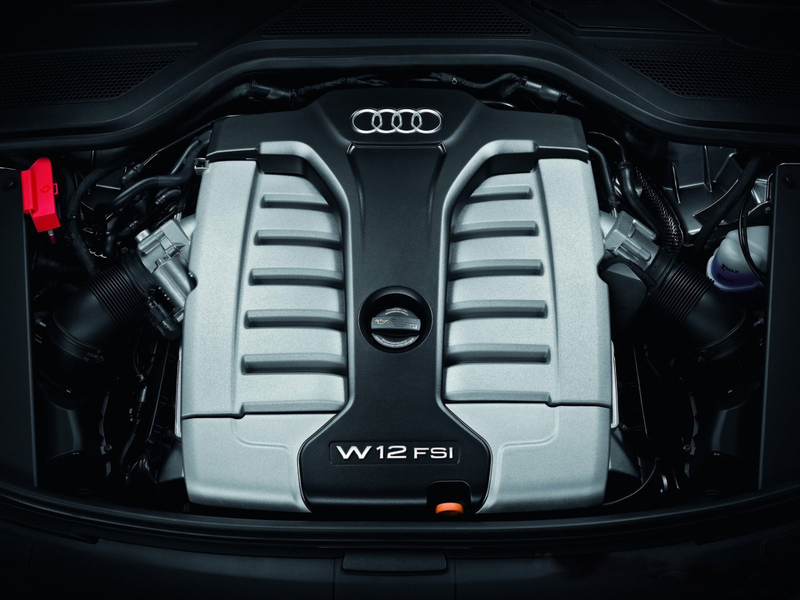 Changes to the Audi A8 L W12 quattro include Active Noise Cancellation (ANC) in the W12, cylinder on demand with six-cylinder mode. The vehicles were unveiled at the 2013 Frankfurt Motor Show, followed by 2014 Toronto Auto Show. 54 PS (40 kW; 53 bhp) @?, 210 Nm (154.89 lbft) @? 245 PS (180 kW; 242 bhp) @?, 480 Nm (354.03 lbft) @? Last updated on 26 April 2014 at 12:19.